Abby would make this for the kids for breakfast and they would go crazy for it. It is still a favorite. I tried to make it on the stovetop like she did, but invariably I burn it. Nothing smells as bad a milk and rice. Yuk. I stick to the oven method. The classic recipe is with raisins, but they make it too sweet for me, so I omit them. Place the milk, rice, cinnamon stick, orange zest, salt and sugar in a medium oven proof bowl and set into oven at 300 degrees for 2 hours. Stir every 20 minutes. Add the raisins if you are using them, vanilla and nutmeg and bake for another 20 minutes. Stir often to keep from sticking to the bottom of the pot. Adjust sugar to taste and serve hot or cold, with some ground cinnamon or nutmeg and orange zest to top as garnish. Arroz con Dulce (Puerto Rico), or Arroz-Doce (Brazil): use coconut milk in place of regular milk. 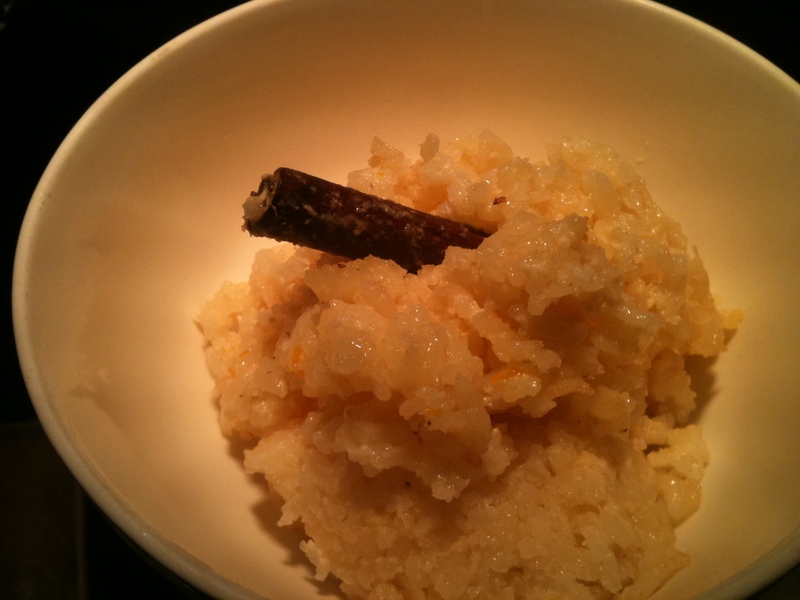 Short-grain rice, like arborio or Valencia rice, is best for rice pudding as it gives the dessert a creamier texture, but regular long-grain rice can be used to good result too. A little more rice can be added if you want a firmer pudding. If the pudding gets too thick, just add a little more milk. Sometimes water, cream, sweetened and condensed milk or evaporated milk is substituted for part of the regular milk. Just make sure the total amount of liquid adds up to 4 cups. And adjust the amount of sugar as needed. Add 1 or 2 tablespoons of brandy or rum when you stir in the butter and vanilla if you like. This entry was posted in Breakfast, Dessert - Eat dessert first, Life is uncertain and tagged milk, pudding, Rice. Bookmark the permalink.